Alright, here's what's hidden behind that big honking driver head with the red X on it. The main feature is the head, which consists of three different metals. All the weight is in the sole -- made of tungsten. Tungsten is two times heavier then steel. Packing the sole full of tungsten gives the club a low center of gravity and raises the MOI. Another cool thing about the driver is that Tour Edge constructs it with brazing. Instead of welding the club head, the parts are chemically treated, pressed together and vacuumed heat cured for permanent bonding. They do this to cut down on the weight, and it also gives the club a bigger spring effect. This is a driver that distance junkies are going to love. 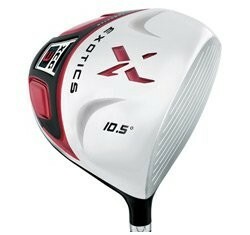 I recommend this driver for all golfers. However, for you higher handicappers, there are much better game-improving drivers out there like the Ping G15.